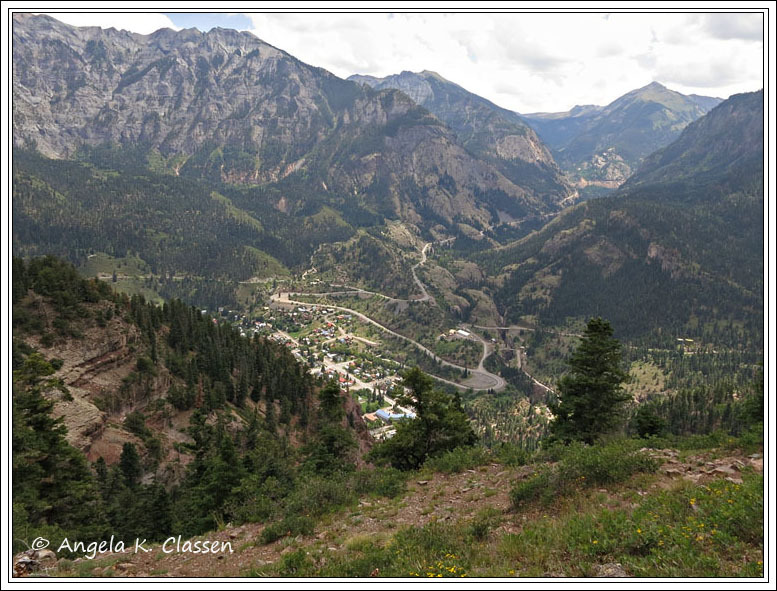 Very spur of the moment, we decided to head to Ouray to hike over the weekend. 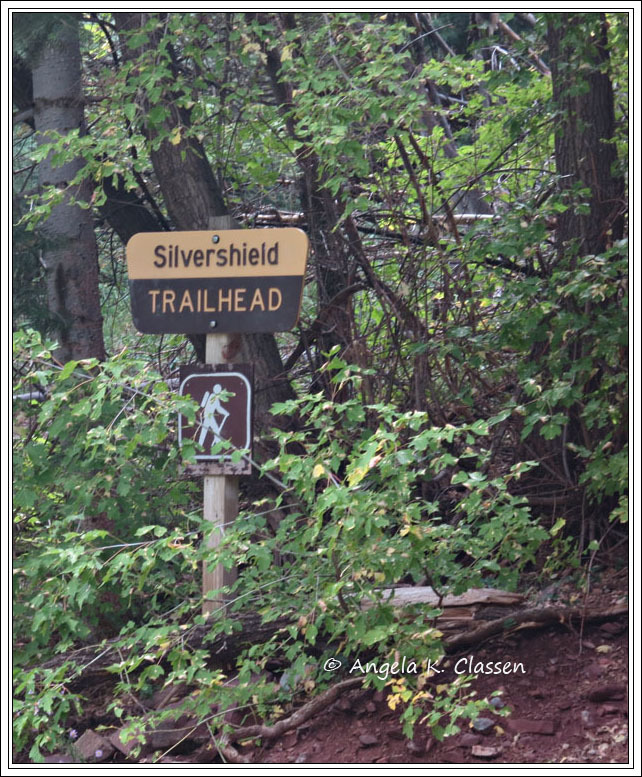 We found a great web site with trail descriptions of the area (http://www.ouraytrails.org/trails.html) and chose the Silvershield Trail #199. 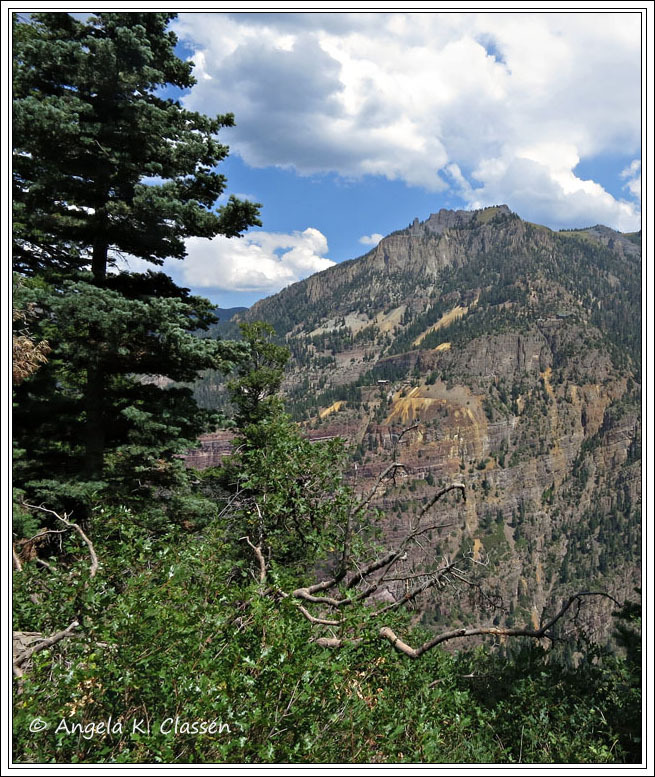 From the description, it sounded like it offered great views of some of the local mine relics and the town of Ouray. 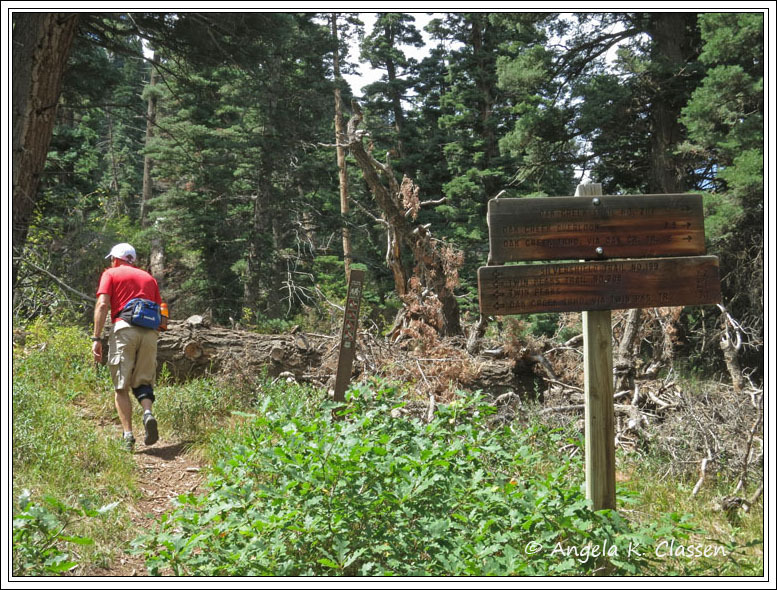 If you take the entire route as we did, you will hike approximately 6.2 miles and gain around 1,680 feet in elevation. I did not bring my GPS so all mileage and elevation information contained here is estimated from info found on web sites and trail signage. The images were shot with a Canon S100 point & shoot as I wisely did not want to haul my big heavy 60D and tripod up the mountainside. The quality isn’t nearly as good, but my back is thanking me today. 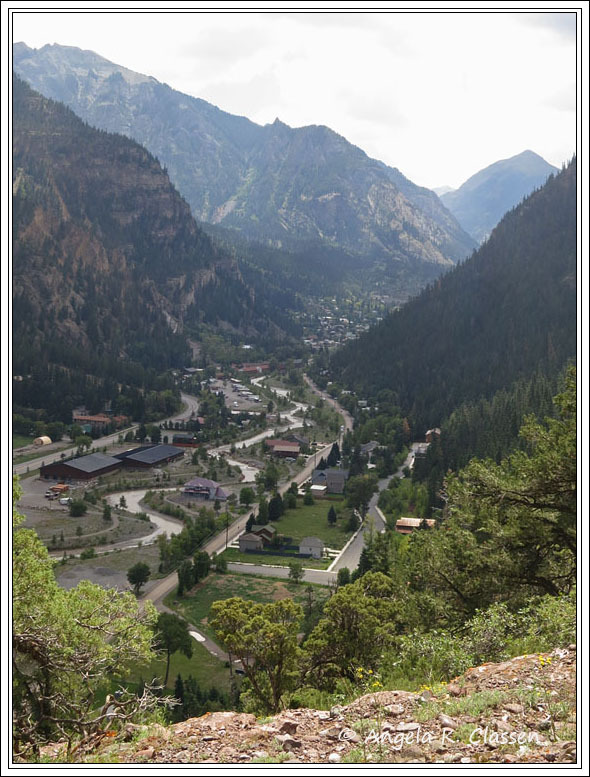 To get to the trailhead from Ouray, take a right off the main street onto 7th Avenue, cross the river, and take a right on Oak Street. The info we found indicated it was called “River Road” but every sign we saw said “Oak Street.” At any rate, it’s the first right past the river. Follow the road past the camping grounds, a mobile home park and a new subdivision. After about 1.2 miles, make a left turn onto a not-well-marked street that has a tiny green sign that says “Silvershield Trailhead.” You go straight into a tiny, tiny parking lot, and the trail starts here. At least the trail was well marked with a sign. If you are even with the Silvershield Mine remains (a big, dilapidated metal structure), you’ve gone too far. Turn around and look to your right for the sign and parking area. At .3 miles up the trail, there is an overlook and, thankfully, a flat spot where you can catch your breath. 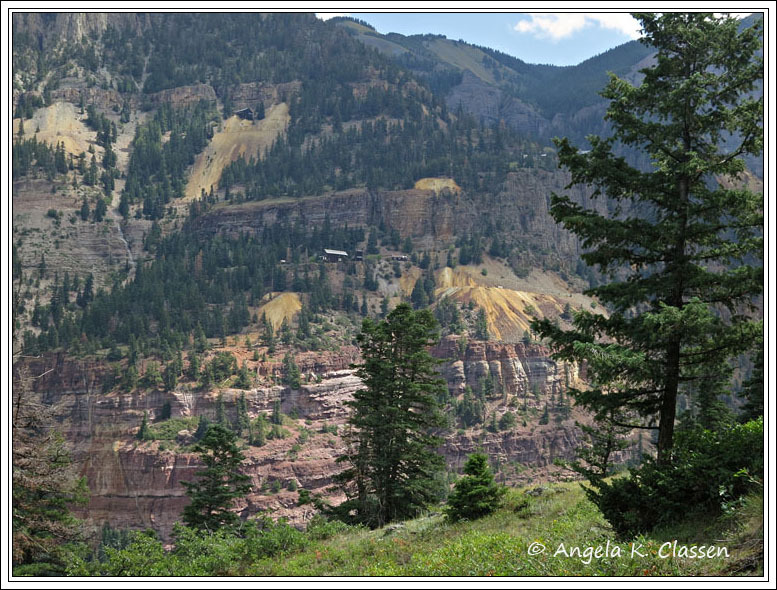 Great views of the old mines on the mountain across the way (Gold Hill) and of Ouray, which was getting smaller by the step. Onward (and upward) we went. The trail continued to snake its way up the mountainside, and rob all the oxygen from my lungs in the process. I kept gauging our progress by watching the mine. We were soon even with it. By the time we reached the juncture with the Oak Creek Trail at 1.1 miles, I thought I was going to die. My lungs were bursting! But WOW, the views!!! I couldn’t stop now. I had so much to see ahead of me. 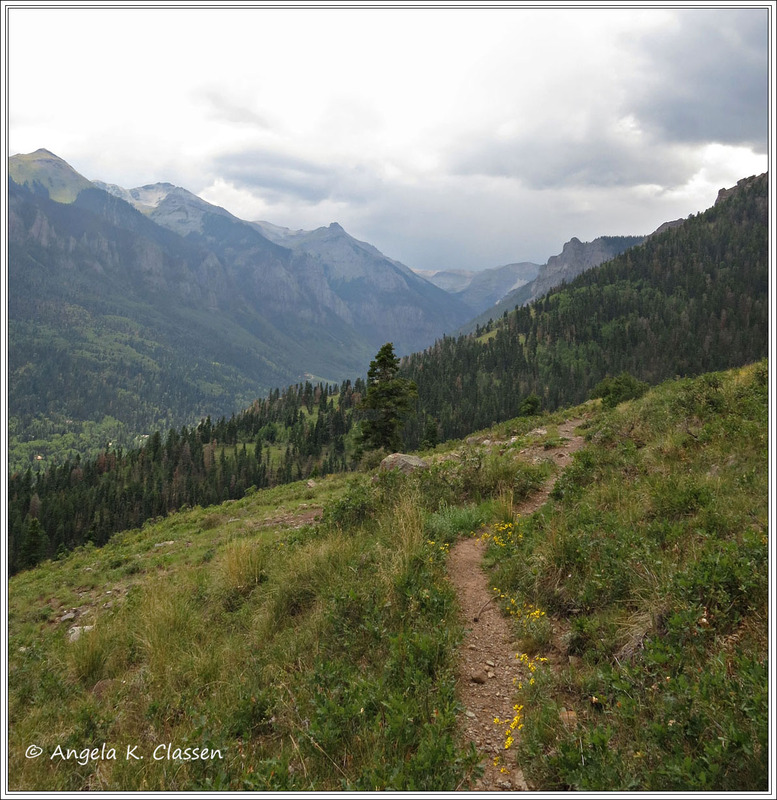 At this point, the trail veered toward the south, which meant back toward Ouray. I couldn’t resist one more peek at Gold Hill. Amazingly, there’s a huge house up above the big abandoned mine. My husband and I peered at the mountainside, in awe as to how someone actually built a real road up to the house (though we couldn’t pick it out). Thankfully, the trail’s steepness dropped off as we had “mostly” reached the top. There was still a fair amount of climbing to be had, but definitely not at the same lung-bursting grade. We broke out into several open meadows, which I’m sure during the summer are filled with wildflowers. We were too late, and with the dry summer Colorado has experienced this year, the crop likely wasn’t as abundant as usual anyway. 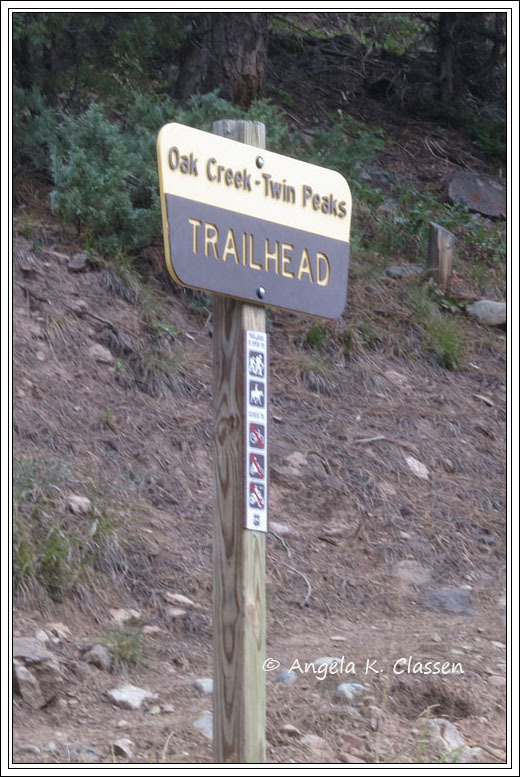 At around 2.3 miles, we reached the juncture with the Twin Peaks Trail and the trail started veering westward. Finally, the trail also started heading the right direction (DOWN!) I will not lie to you: it is STEEP going this direction as well. Be careful, watch your footing, and don’t let yourself get out of control because you could fairly easily slip, slide, pitch over the edge of the cliff, and well – DIE. Despite that hanging over your head, enjoy the views. They are spectacular! There is one creek crossing. At this point in late summer, it was easy as pie, but it could be an entirely different story during times of high runoff and after heavy rains. Use your common sense whenever doing water crossings. Less than a foot of swift-moving water can knock you off your feet and sweep you away. After the creek crossing, you go up again for a short time (don’t worry, it’s not long! ), and you get spectacular views of the Twin Peaks. Unbelievably, up to this point in our hike, we had not encountered a SINGLE person. About a mile from the bottom, we ran into our first group of hikers. Then, at long last, we reached the bottom of the mountain. Whew!! We then had to walk back to our car on the River Road a/k/a Oak Street. 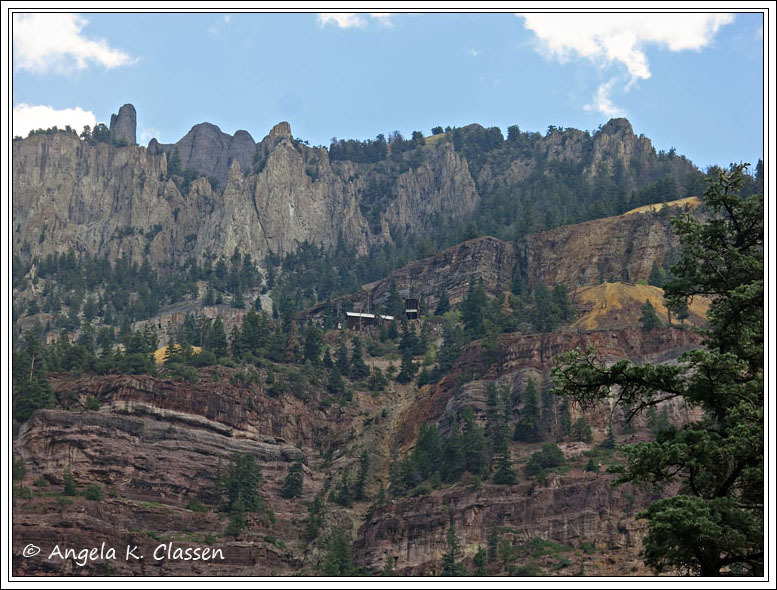 Not the most pleasant part of the hike to be sure, but it was neat to get an up-close look at some of the neat Victorian style homes in Ouray with their cute little yards and gardens. We could have simply turned around, but we tend to like loop hiking to avoid duplicating our steps. 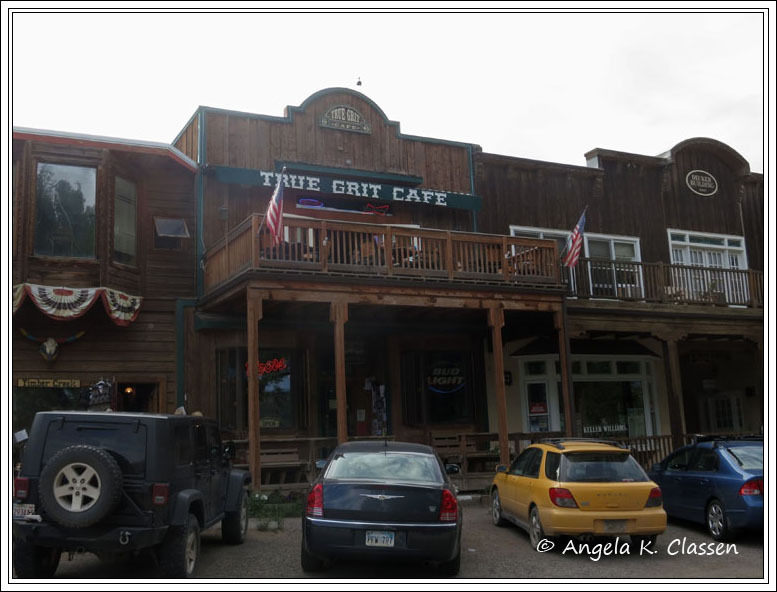 We ended the day by eating at the True Grit Cafe in Ridgway, which was the town where part of the John Wayne classic “True Grit” was filmed. The south wall of the cafe at that time was on the exterior side and was used in one of the town scenes. The food and service here is good (with plentiful portions), the prices not too outrageous, and the cafe is chock full of John Wayne memorabilia. 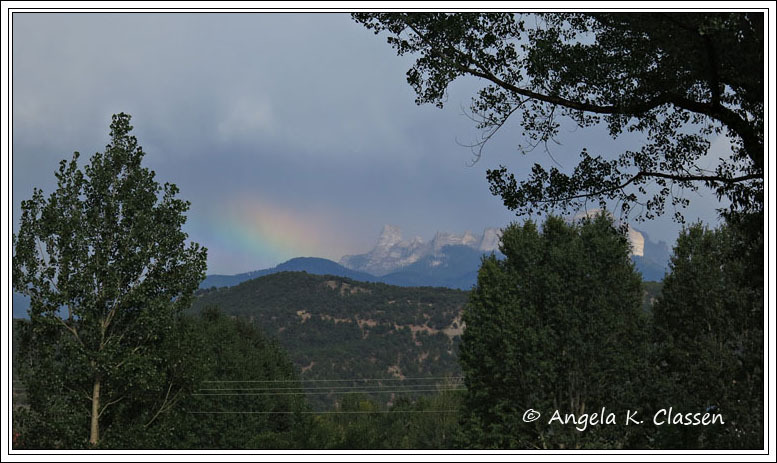 Just as we left, a rainbow formed over the Silver Jack Reservoir area. What a neat way to end a great day hiking in the glorious San Juan Mountains of Colorado! Ah, living in western Colorado offers so many recreational opportunities, even in the middle of winter, especially during a winter as mild as 2012. This afternoon I took advantage of the near 50 degree, sunny day and hiked the Echo Canyon Trail at Colorado National Monument. To reach this trail, enter through the east entrance of the park and park at the Devil’s Kitchen trailhead. If the tiny little lot on the east side of the road is full, pull into the larger parking lot across the road and up the hill. Yes, you’ll have to hoof it a little further but with this being the trailhead for five trails, it’s quite likely the small lot will be full on any given day, especially on weekends. Serpent’s Trail, Devil’s Kitchen, No Thoroughfare Canyon and Old Gorden Trails also originate at this point. 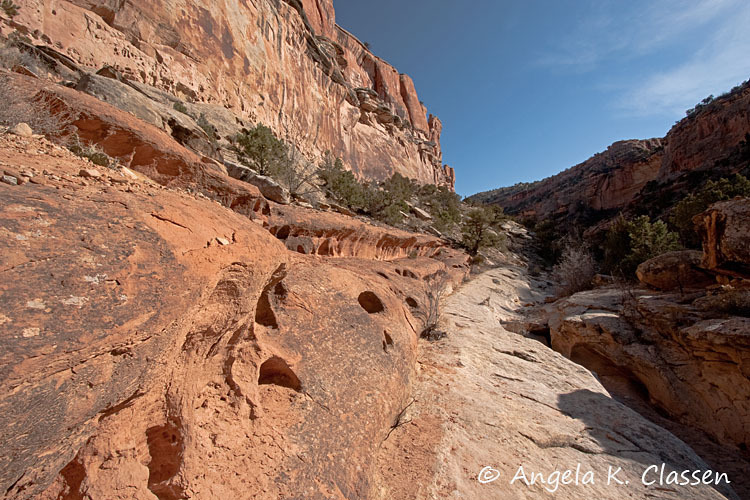 To hike to Echo Canyon, head to the south from the parking lot, down the Devil’s Kitchen trail. Soon it splits off, and Old Gordon and Echo Canyon head to the left. You’ll go down a hill and across a wash, and will then see a sign pointing UP. You travel up a section of bumpy slickrock for about a half mile. If you’re middle-of-winter out-of-shape like I was today, this little stretch will definitely wind you. The park service apparently had to re-route this trail as someone bought the land off to the left and fenced it off. However, they’ve done a brilliant job of outlining the trail with stones so you don’t lose your way on the slickrock. There are some really nice views up here, and you’ll probably drool over the expensive homes you can see (I know I did). When you see another sign pointing to the right for the Old Gordon Trail, and to the left for Echo Canyon, congratulations! You’ve reached the summit of the ridge. From what I’ve been able to find out, total elevation gain is around 200-250 feet (but it sure felt like more than that today hauling my camera!) Follow the trail to the left, where it begins to descend. Finally, your lungs will get a break as you descend and get closer to the mouth of Echo Canyon. You also finally lose sight of civilization and feel like you are on a real hike. 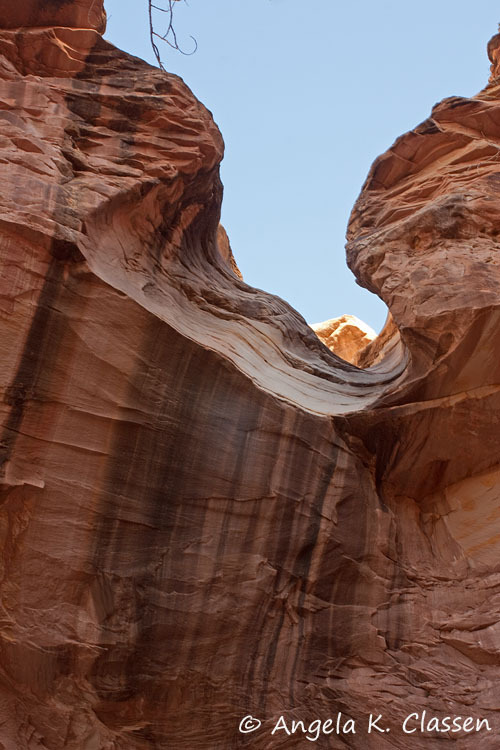 You’ll make a turn to the right as you enter the canyon, and soon you’ll be on its floor, following a little stream. There is lots of vegetation and quite a few cottonwood trees in this area, although of course today it was all brown and dead. I’ve read that there is a lot of poison ivy in the warm months, so be careful of that. Fortunately, I didn’t have to worry about it today! The walls of the canyon soon soar far overhead, glowing red, with streaks of desert varnish down their sides. Lots of interesting rock formations here as well, especially my favorite – “swiss cheese” rock. It’s not a very scientific name, but that’s what I call rock peppered with round holes. There are also quite a few very large boulders strewn about. It made me look up, trying to figure out where they fell from. 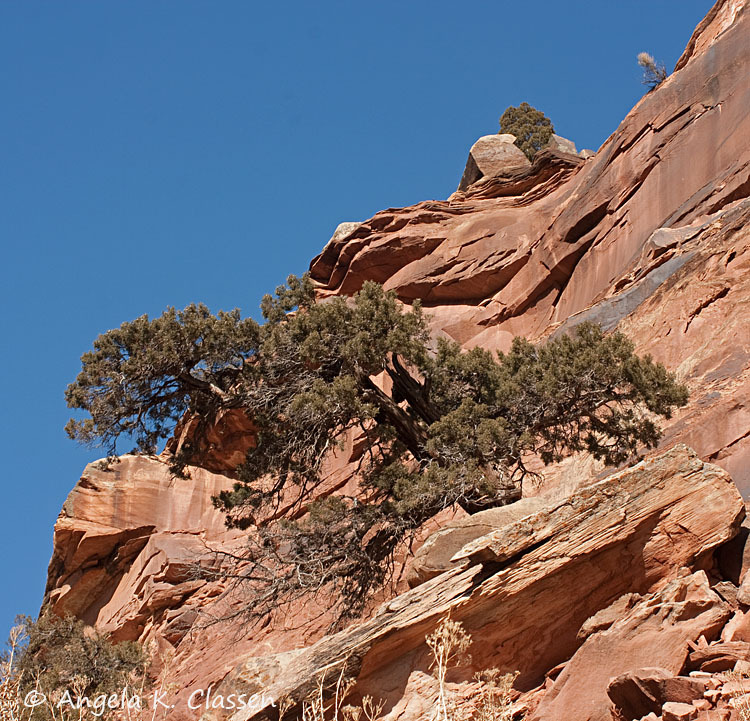 And it always amazes me to see juniper trees growing on top of ledges. There was one really interesting stretch where you climb out of the wash and up and over a rock ledge. The trail is easy to follow, going in and out of the wash. The canyon is narrow so there’s really no way you can get lost, especially since this canyon is a box canyon. You know when you’ve reached the end, because there’s absolutely no way out but back the way you came in. 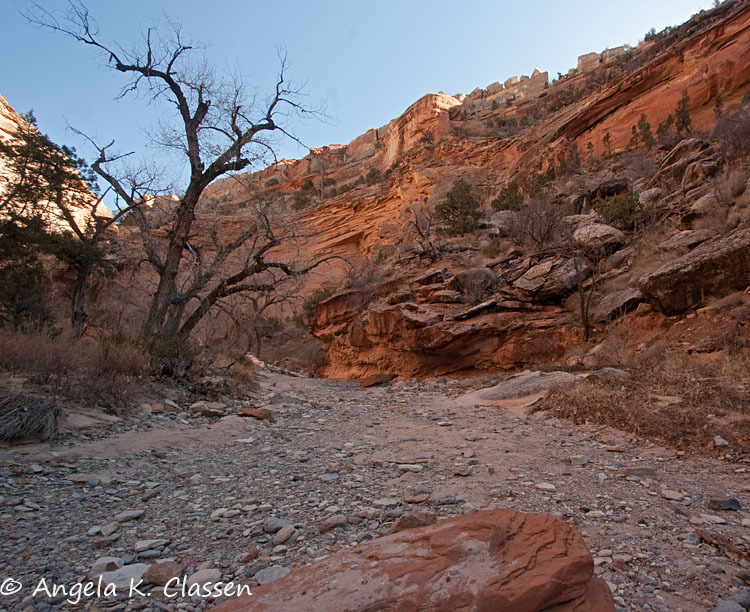 When I reached the end, the canyon walls on my left were reflecting incredible light onto the walls on the right. Reflected light like this is beautiful but I found it hard to capture with my camera, especially since I didn’t haul my tripod with me. Ironically, tonight in the mail I received my new Gorillapod mini-tripod. Wish I would have had it yesterday so I could have tested it out today! Probably the highlight on this trail during the warmer months is the possibility of a fairly good sized waterfall spilling over the notched ledge. Of course today there simply wasn’t any water flowing here, but I can imagine in early spring when the runoff is coming from Glade Park and above, it is probably a totally different story. I am definitely coming back in spring to find out! 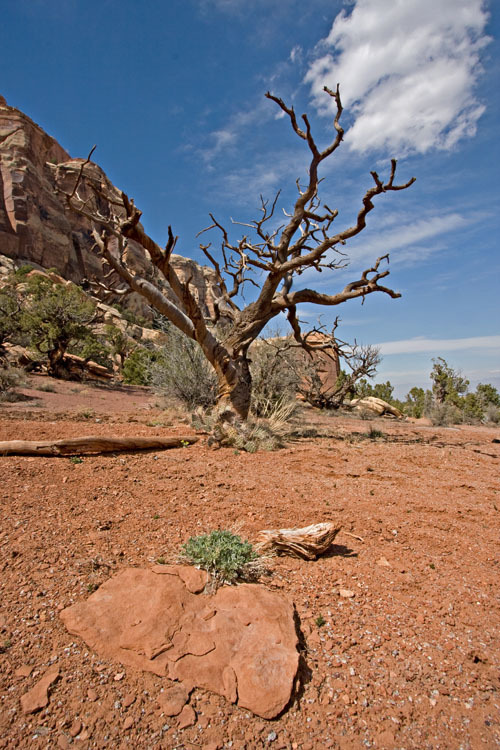 There are a few nice cottonwood trees that would also look beautiful in the fall with their gold foliage contrasting with the red canyon walls. You guessed it – that will be yet another trip back for me! Today what little water was left in the pool was frozen over. There were not very many hikers on this trail today (I saw maybe a dozen total) but probably in the warmer months it’s more crowded. Today, however, I reveled in the peace, solitude and beauty. This trail is about a three mile round trip and was a great way to spend an unusually warm February afternoon. Once into the canyon itself, the hike was beautiful, and in warmer months would offer even more beauty with blooming wildflowers and cacti. Due to the climbing, I would rate this as a “moderate” hike, but it’s definitely not that physically demanding, and the breathtaking scenery is worth it. 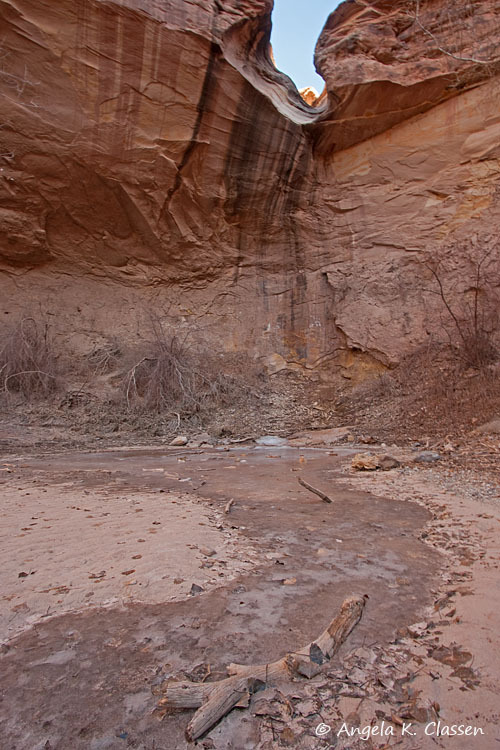 As in all canyons, exercise caution and don’t hike here if there is an incoming storm near or upstream. 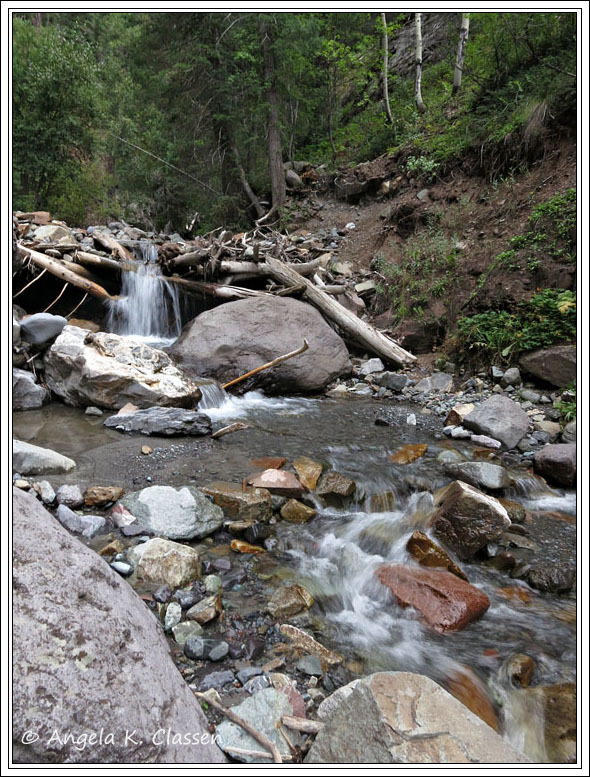 There are not many places where you could escape the rushing water in the wash, so use your common sense. Even before we moved here a year ago, I wanted to check out the Rattlesnake Canyon and its arches, touted as having the world’s second largest concentration of natural arches outside of Arches National Park. 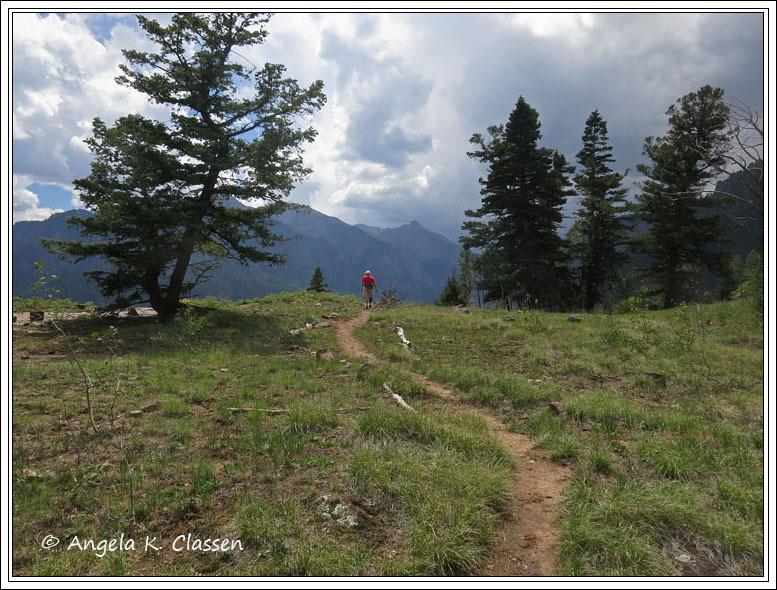 My interest was piqued even more when my husband did a couple of trail runs into the area from the Pollock Bench trailhead after we moved here. Unfortunately, I’m not in the physical shape he is, so a 15 mile strenous hike, with climbs and scrambles up and down small canyon walls to get there was not an option for me. We decided to check out the somewhat easier 4WD route to the trail on Saturday. 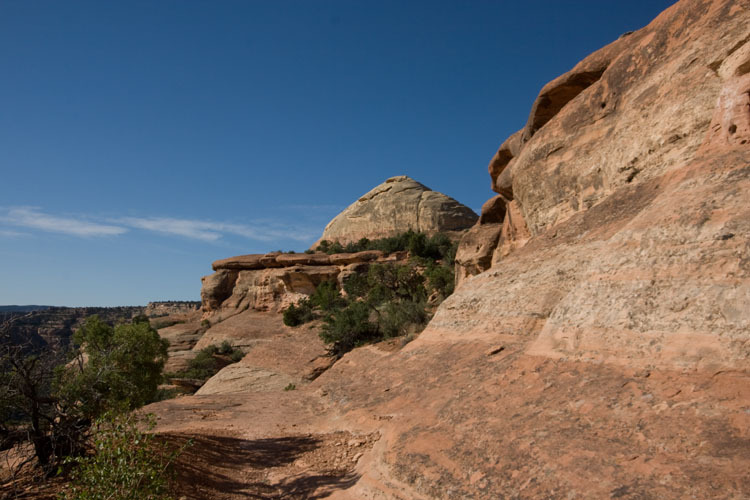 There are three ways to access the trail to the arches. 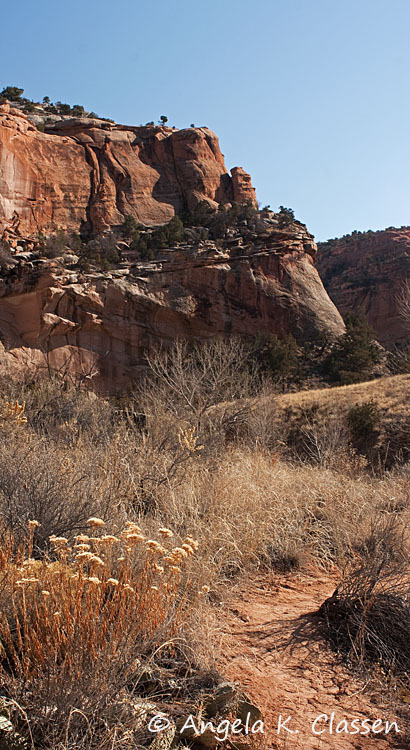 The first is via the Pollock Bench trail, which begins in the McInnis Canyons Conservation area near Fruita, south of the Colorado River. 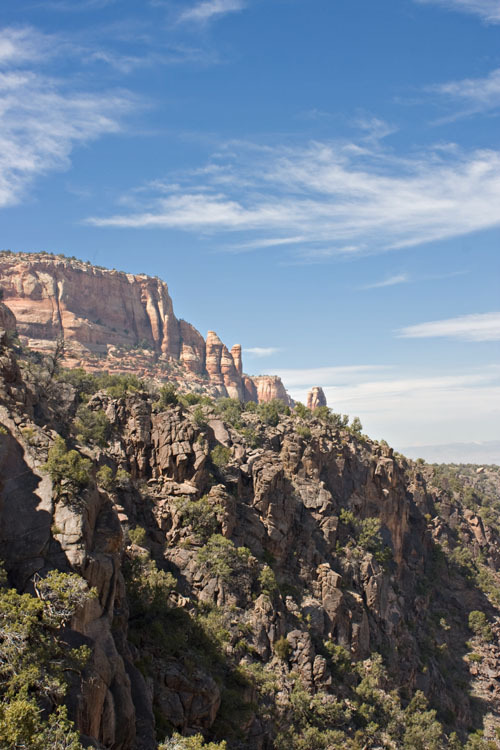 This trail is not for the faint of heart – it’s a grueling 15 mile round trip, and you must do some climbing. Another route for you river rats is accessed from the river, launching from the Loma boat ramp. Since I’m scared of heights and am a wimp, and I can’t swim, the only option left for me was via the 4WD road which is accessed via the west gate of the Colorado National Monument. (I’m told if you let the rangers know you are just going to the Rattlesnake Canyon trail, you won’t be charged admission fee. We have a park pass anyway, so didn’t try it.) Drive up Rim Rock Drive for approximately 11 miles to 16 Road/Glade Park and turn right. Very shortly thereafter you pass over a cattle guard, and the sign for the Black Ridge Access Road is immediately to your right. Turn right onto this road and let the adventure begin! 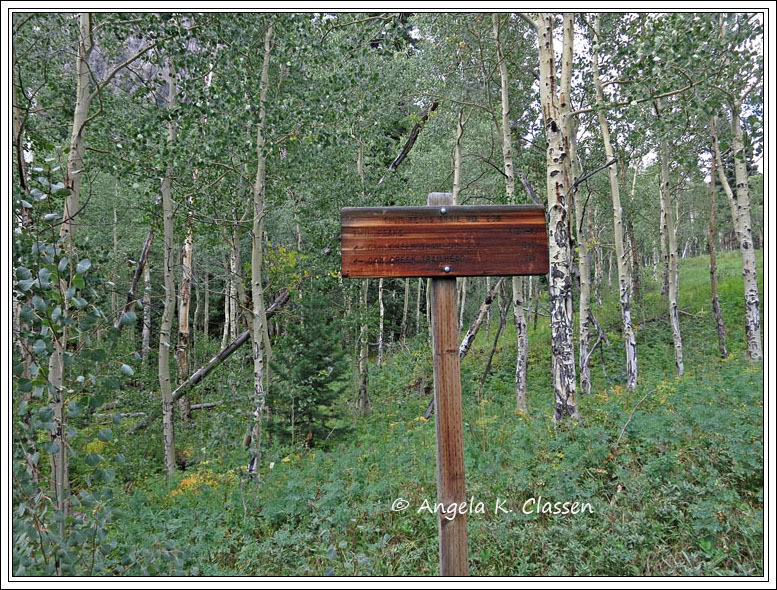 Watch for the signs – they are hard to see. Follow Black Ridge Road to the juncture of the Upper and Lower access roads, and pick one (flip a coin if you must!). We drove the Upper road and I must tell you we thought it was pretty gnarly about a mile or so from the trailhead. Much of it is easy but that last mile or so is a doozy, with some steep terrain and lots and lots of rocks. Since we didn’t take the Lower road, I can’t vouch for its condition. DO NOT attempt either of these roads in a low clearance vehicle – I guarantee you’ll tear off the bottom of your vehicle! 4WD is definitely recommended due to the steep terrain and you just may not have enough oomph to make it up the hills with 2WD. You should NOT attempt this drive/hike if there’s ANY chance of rain. Both the Upper and Lower roads become impassible when wet, and these roads are totally closed from late fall until late spring. People HAVE gotten stuck and stranded. You don’t want to be one of those folks, trust me. There is very little traffic on this road so rescue would be very long in arriving (not to mention expensive). After a few miles, you will pass another junction with the Mee Canyon road. 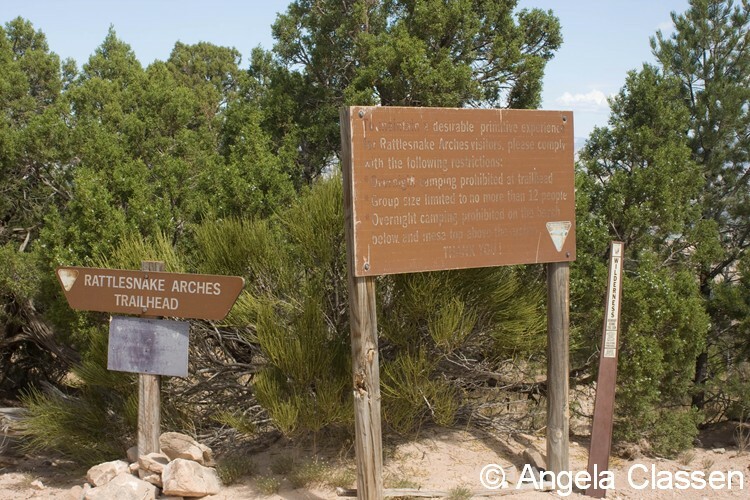 Stay to the right to Rattlesnake. There are several camping areas if you choose to do an overnight in this area (surprisingly I did see one tent). There is no camping allowed at the trailhead. We didn’t measure the distance, but figure it’s somewhere around 10 miles from the time you turn off onto Black Ridge until you finally reach the trailhead. We honestly thought we’d overshot it somehow and needed to turn around, when we finally saw three cars at the trailhead. Yes, three cars. If you like solitude, this is the hike for you. The trail heads down an old jeep road for about half a mile, where there’s a junction with a trail where you can walk another half mile to an overlook of the last arch (this will add a mile to your total trail mileage). You will actually be above this arch. We decided to save our energy for the main event and skipped this part. 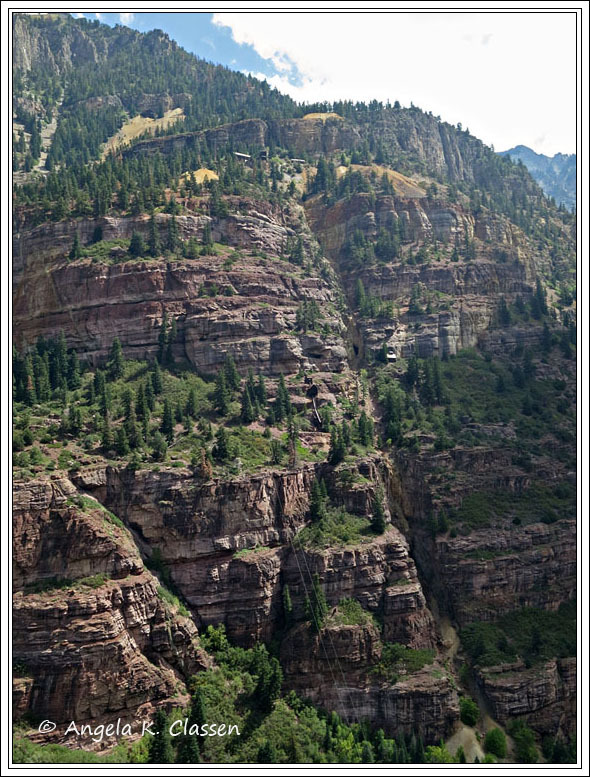 We kept heading down the trail, which at this point heads steeply down the canyon wall. There are several sets of switchbacks as you wind down, and finally arrive at yet another juncture. This is where the Pollock Bench trail comes in from the right. 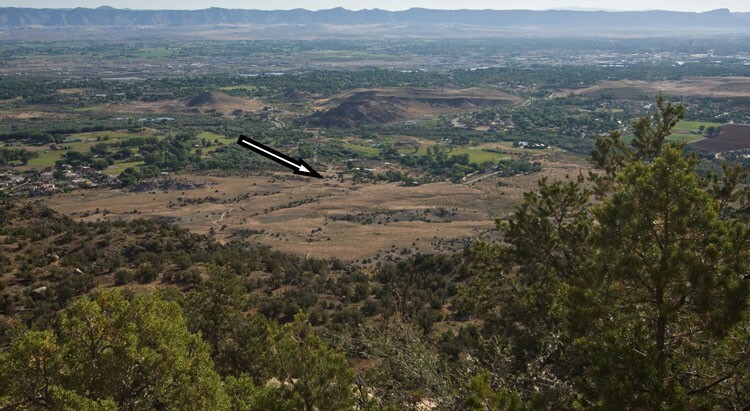 As you head toward the arches, if you look carefully back at some point, you can faintly see another arch which is on the Pollock Bench trail. We didn’t head toward that one either, staying on point with the main concentration of arches. 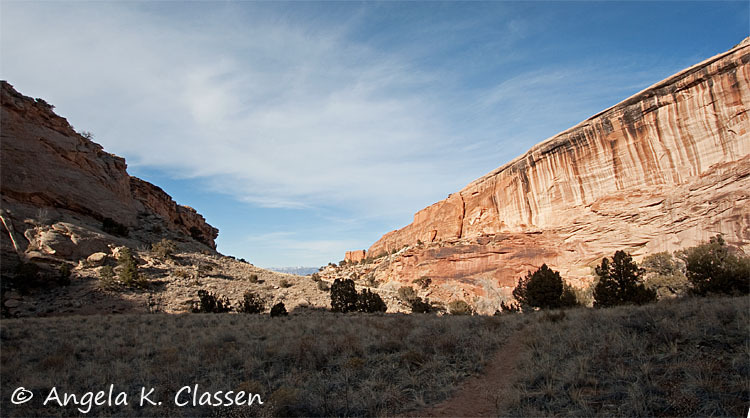 You will pass by a large sandstone point, and it’s shortly after here where the arches start to appear. The hike through this area is pretty easy and level, with just a couple places near the arches where you actually have to deal with some large steps/rocks. 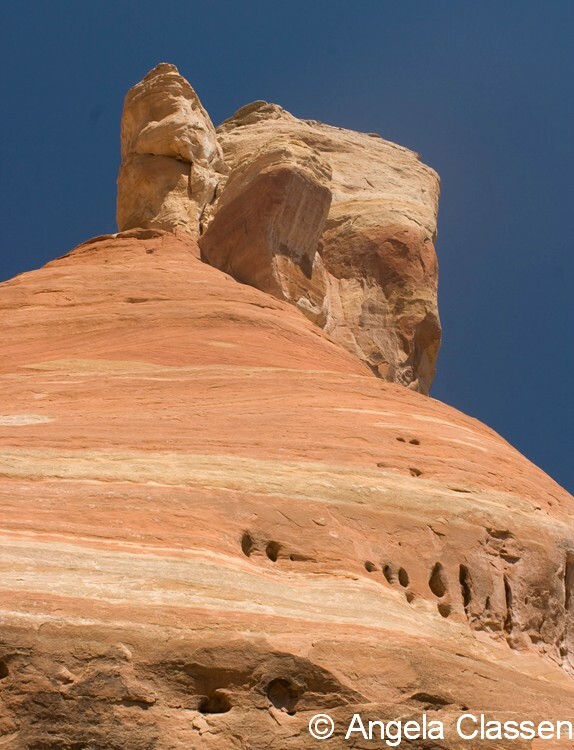 In between the arches, there are fascinating sandstone formations to your left, and the awesome Rattlesnake Canyon to your right. The views are impressive wherever you look. 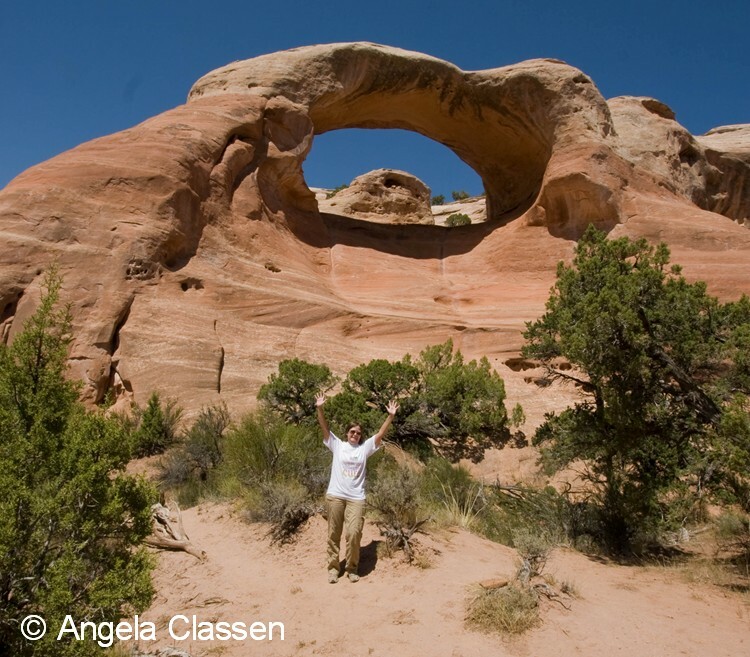 The arches, formations and colors are very similar to the Arches National Park and Moab area. A photographer’s dream! 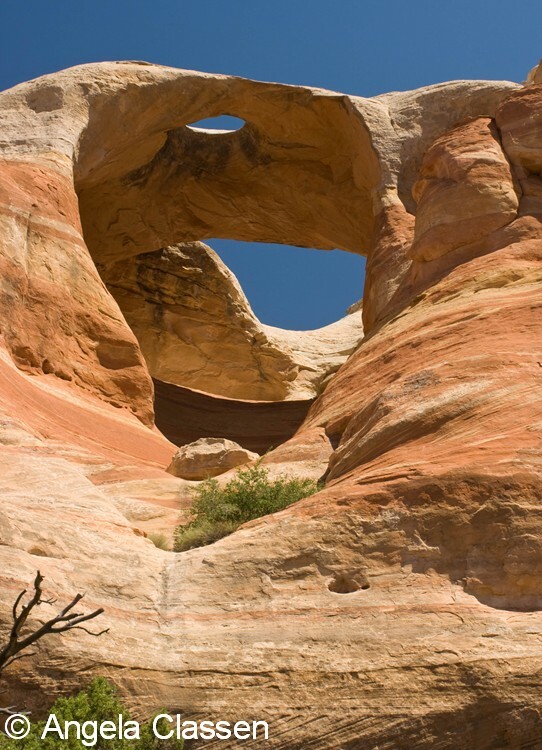 The first arch is called Hole in the Bridge Arch, or simply Bridge Arch. 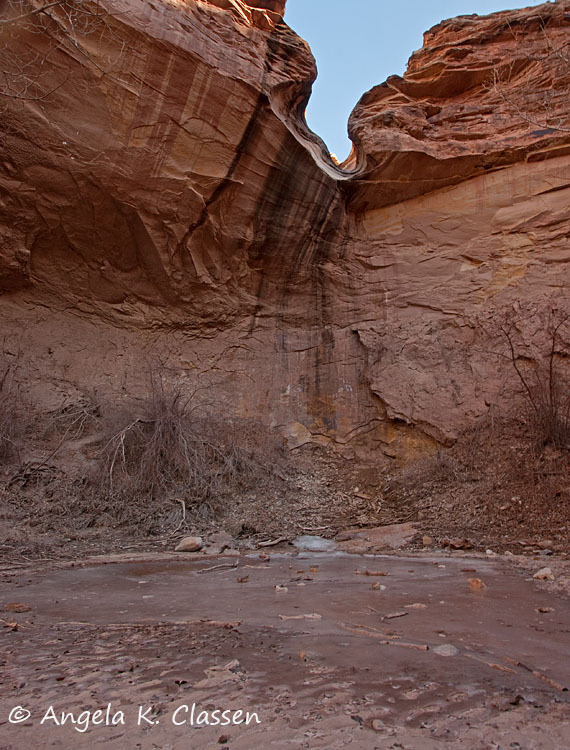 A pothole from above has slowly eroded into an arch through the top. Next up was Eye Arch, named for obvious reasons. The next arch was my very favorite of the bunch. 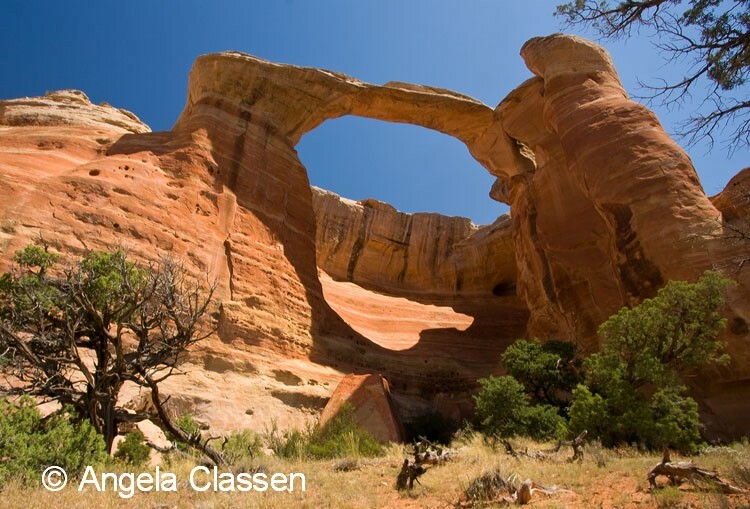 It has several names: Akiti Arch, East Rim Arch or (my favorite) Centennial Arch. It has an impressive span of 40 feet and an opening height of 120 feet. From this photo, the right tower appears to be leaning. This is due to perspective issues with my 10-22 mm lens which is unfortunately permanently stuck on 10 mm (need to get it fixed!) This is definitely a wide angle lens type of place because the trail passes very close to these arches, and on the other side of the trail is the steep Rattlesnake Canyon. There isn’t a lot of room to maneuver around so a WA lens is definitely a plus. 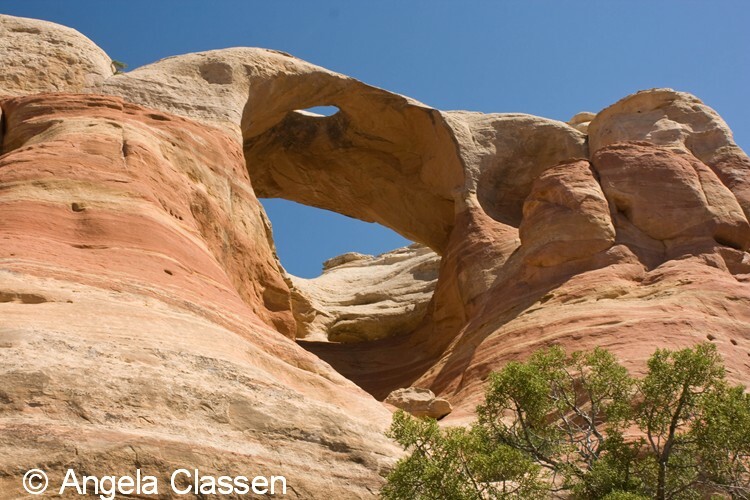 The last arch (which is the one you can see from the viewpoint I mentioned above) is called Cedar Tree Arch or Rainbow Arch. It has a massive span of 76 feet and an opening height of 43 feet. I didn’t explore this arch up close, but I’ve read there is actually a way you can climb up and effectively make a loop out of the hike. Since I’m afraid of heights, I do not recommend this, especially if carrying precious camera gear! Me, trying to act like I'm having fun while secretly dying of dehydration! Now, the reason I didn’t take many photographs in this awesome place is simple: I was dehydrated. I thought I had been drinking enough water but I knew even before the half-way point of the trail that I was in trouble. 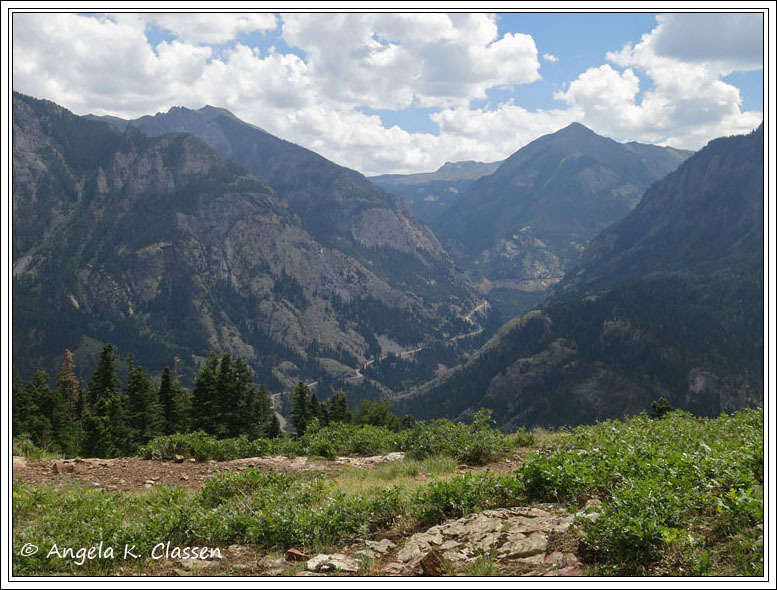 We started out way too late in the day, we underestimated how long it would take to arrive at the trailhead, and the early afternoon, late August, Western Colorado sun was absolutely unrelenting. Even after taking a granola bar/water break before reaching the end of the trail, I was still lightheaded and weak and had to stop numerous times, even on the flat areas. I had to get out of that damn sun! While attempting to scale the canyon wall back up, I honestly didn’t think I would make it. My heart was exploding in my chest, I had a tingling sensation in my arms, my head was swimming and I was sure I was going to pass out and roll down into the canyon, never to be seen again. Not a good sensation… However, I finally did make it up and back to our truck. I was never so relieved to see that beautiful Tundra! When we got home, it was all I could do to drag myself into the bathroom for a quick shower then flop into bed and rest. Recommendations for this hike: DON’T attempt if it looks like rain as the roads become impassible. DO drink LOTS of water, more than you think you need. There is scarce little shade offered by junipers on this trail. DO use copious sunscreen and a wide-brimmed hat. 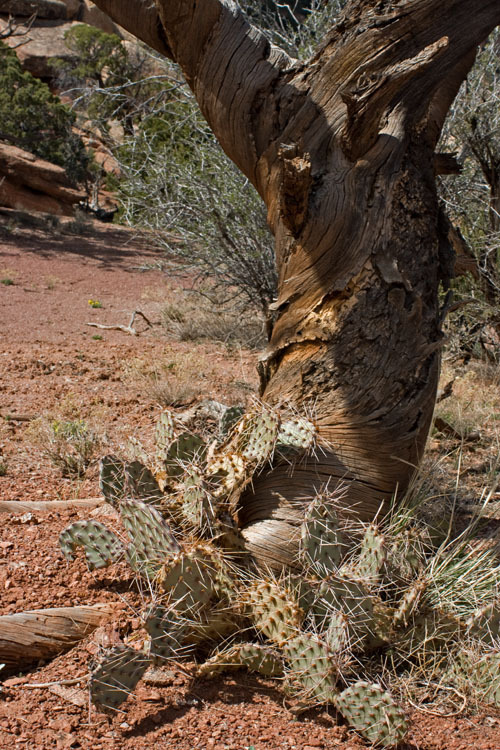 DON’T plan an early afternoon summer hike if you can’t take the heat and sun. DO watch the weather and if it appears rain is on the way, get the heck out of there. Where all the arches are located is an exposed bench of sandstone which equals a lightening rod. DO bring a wide angle lens and a polarizer. DO have fun!! Will I do this hike again? Heck yeah, if I start earlier or go at a cooler time of year. 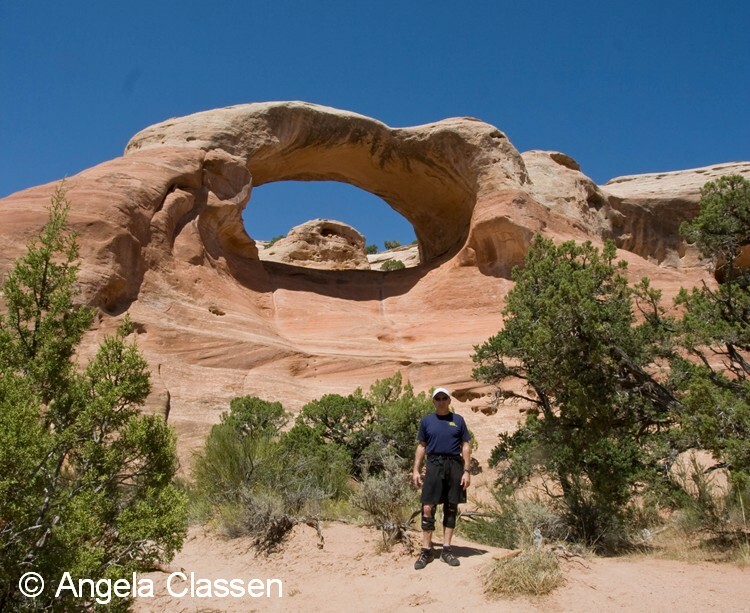 The views from anywhere on the trail are awesome, and the arches are icing on the cake. The hike itself is pretty easy, except for the last climb up the canyon wall. 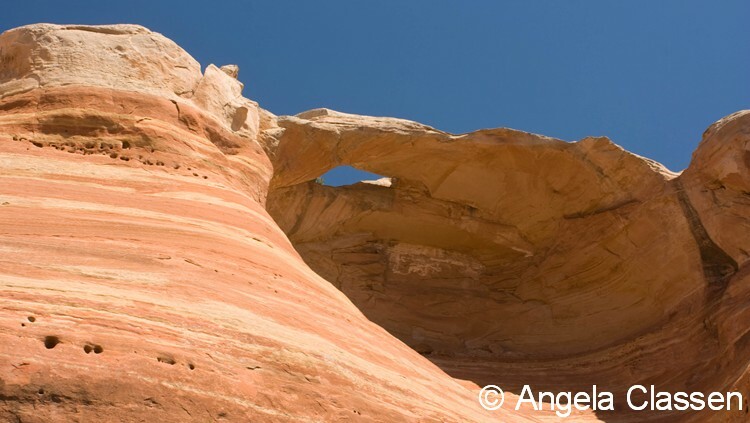 I would love to spend more time exploring every nook and cranny of the fascinating features of Rattlesnake Canyon and its arches. Yesterday morning at 7:15 a.m., I arrived at the Wildwood Trailhead, grabbed my small camera bag and water bottle, and headed up the trail. 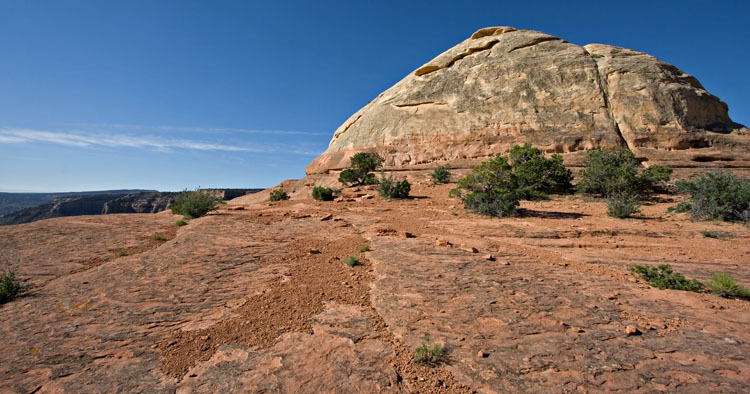 My destination: Liberty Cap, a sandstone formation that sits atop a high cliff in Colorado National Monument and looks like a giant sandstone Hershey’s Kiss. Looks kind of far away in the photo, doesn’t it? 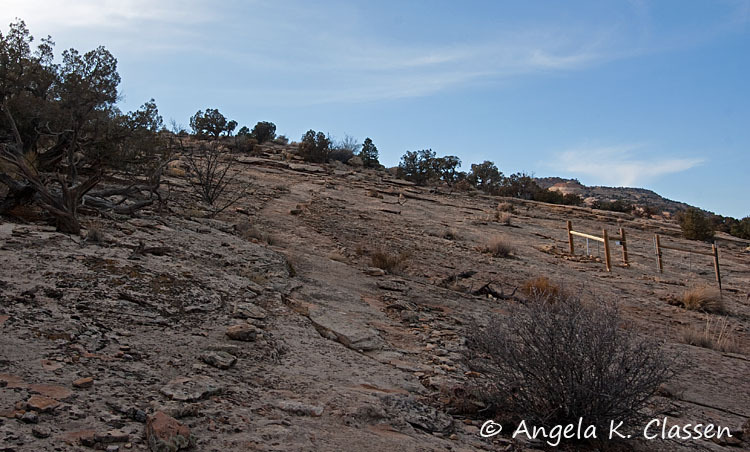 The hike up to the Liberty Cap is only 2 miles from the trailhead, but seems much further due to the steep ascent. It’s a killer, and if you are scared of heights/exposure (like I am), I DO NOT recommend hiking DOWN the Liberty Cap trail. The trail is very steep with loose scree and gravel, and just the thought of going down, looking at the sharp dropoffs, gives me chills yet. I can hike UP the trail, simply because I can’t see how steep it is behind me. The worst part by far is from when you begin to climb up behind the big slab up until the juncture where the Liberty Cap and Corkscrew Trails split (about a mile). Here is a shot of the trail juncture. I found a rock (in the shade) and rested for several minutes at this point, drank some water, ate my granola bar, and watched a brightly colored collared lizard eat a mid-morning snack. The ascent up the second mile to Liberty Cap is a little more gentle and is full of switchbacks as you still do quite a bit of climbing. While going up, the trailhead parking lot caught my eye. My car was just a tiny dot, and I still wasn’t all the way to the top yet. 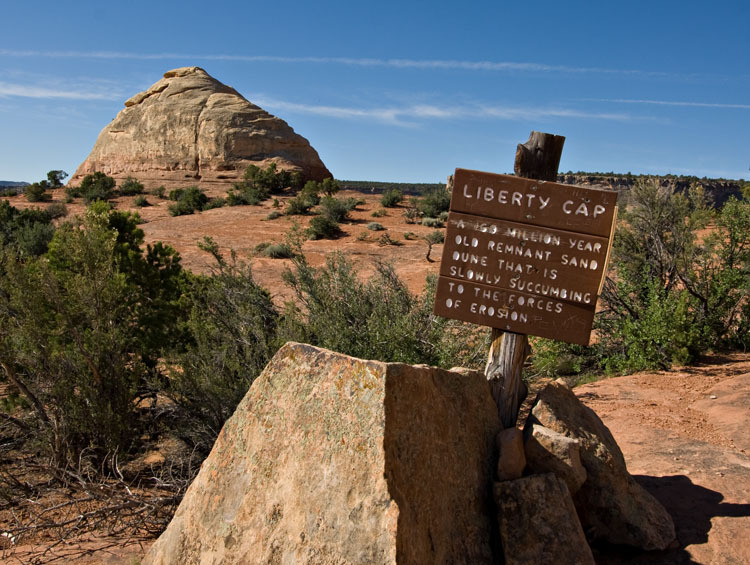 Finally, I rounded a corner and was able to see the Liberty Cap. I had reached my destination! 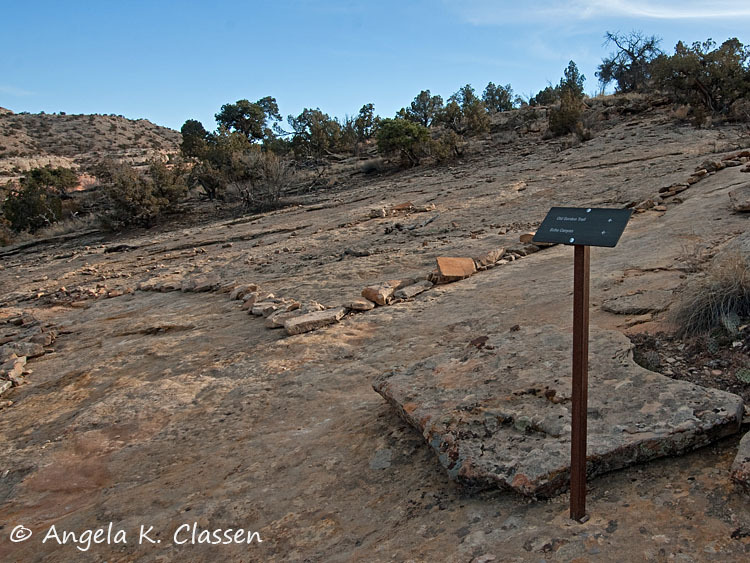 Until recently, there was an old ladder on the north side of Liberty Cap that you could climb all the way to the top. The NPS has taken the ladder down for now due to safety concerns. Of course, since I’m afraid of heights, I wouldn’t have attempted the climb anyway! The contrast between the two “worlds” you can see from the bench at the top is amazing. On the north side, the developed Grand Valley with its irrigated fields, orchards and suburbia spreads out before you. 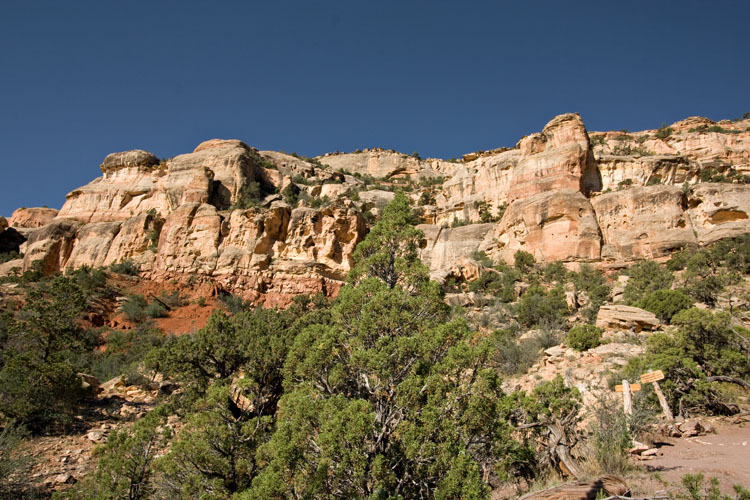 On the other side, the beautiful unspoiled, wild red/orange walls of Ute Canyon, punctuated with the vibrant greens of pinyons, junipers and sage, rise from the canyon floor. I walked around for a bit, savoring the gorgeous views from high above. I wandered and found the official sign for Liberty Cap, which was actually quite a ways back from it (what’s up with that?) 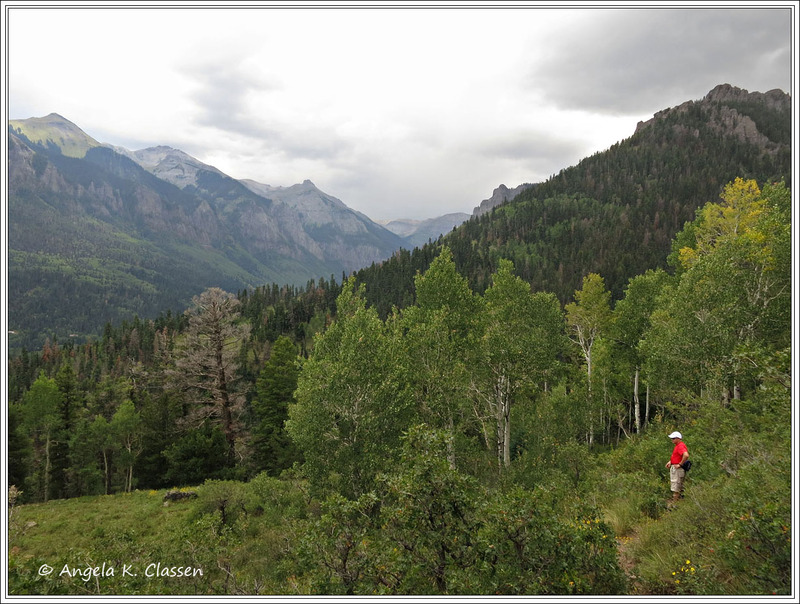 The trail does continue from here and winds its way back down to the floor of Ute Canyon and on up to Rim Rock Drive (a distance of another 5 miles, with little elevation gain). I opted to head back down instead. 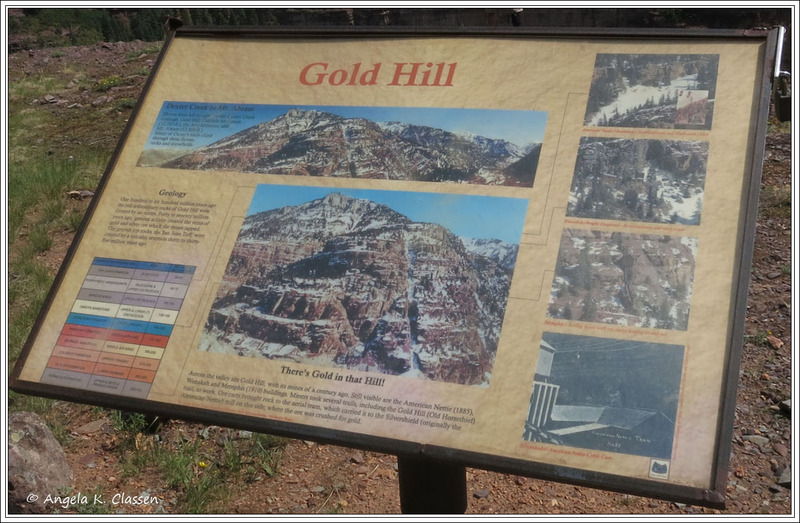 I headed back down to the trail juncture and went on the Ute Canyon/Corkscrew Trail, which in very short turn splits yet again, with the Ute Canyon Trail heading up the canyon, and Corkscrew going down. There is the most awesome old dead tree near the second junction that if I could be there in the right light, and find the right composition, would be such a cool subject to shoot. The Corkscrew Trail is aptly named, as there are numerous switchbacks to get you back down the canyon wall. The descent is so much more gentle than the Liberty Cap Trail, it’s amazing. It also makes a nice loop in combination with the Liberty Cap, and allows you to see geologic features from different perspectives. You get great views of the Precambrian rock in this area coming down the Corkscrew. The Precambrian rock is the dark, black rock and are the oldest group of rocks on earth. Unfortunately, about 3/4 of the way down the trail, I somehow lost the trail. Don’t know how that happened as it’s pretty well defined, but somewhere in scrambling down the numerous washes and boulders, I found myself in a spot that didn’t look familiar, and I had been moving too long (and not really paying attention to where I was going) to simply retrace my steps. I knew I needed to keep going down off the canyon wall, and then needed to veer back west. I was a little worried because I had greedily sucked down all but two swallows of my water, thinking I was “almost there.” The temperature had risen to the mid-80’s already, and the sun at this altitude is intense and unrelenting. I also had seen only 6 hikers on the trail in a space of 3 hours. Not good… I kept following the wash I was in, then when it joined another wash, followed it down until almost at the bottom. I decided at this point it would be best to climb up on a ridge to get a better perspective of where I was. I decided to start heading west, and about 5 minutes later I found a very faint path. I followed it in hopes it would lead me to the main trail, and fortunately it did. I was never so glad to see an official trail marker! When I finally got back to my car at around 11 a.m., I was thoroughly exhausted and extremely thirsty. I stopped at the Conoco station at 24 Rd. & Patterson, bought a 32 oz. Pepsi from the fountain with as much ice as I could pack in the glass, and sucked down half of it before I got home. I had hiked right at 5 miles with an elevation gain of around 1,000 feet (most of that gained in the first mile of the trail). The views from the bench surrounding Liberty Cap are amazing and well worth the effort. It’s a hike I will definitely do again!